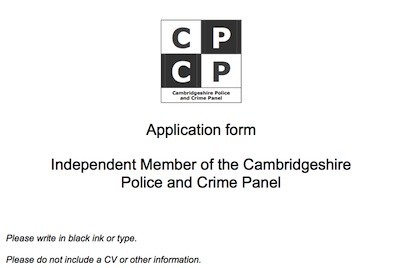 On the 26th of October 2012 I submitted an application to become one of the two independent, non councillor, members of Cambridgeshire’s Police and Crime Panel. I am making the application, and covering email, which I submitted available publicly below. I am writing to volunteer to serve as one of the non-councillor members of Cambridgeshire’s Police and Crime Panel. I would like my application to be considered primarily on the basis of my performance, to-date, as a member of the public scrutinising and constructively lobbying local elected representatives and members of the Police Authority. All of my activities have been carried out publicly and have been reported on my website at rtaylor.co.uk and on my Twitter feed (@RTaylorUK). I will be publishing this application openly on my website; you may wish to view it there where it benefits from additional formatting. I obtained the application form from the appendix of the report to item 7 of the Shadow Police and Crime Panel meeting on the 18th of October 2012 (which I lobbied strongly to have made public). The copy of the form I have is an uneditable PDF so I have extracted the questions and addressed them below. I have on too many previous occasions when dealing with arms of state proven my ability to print responses on to paper or PDF forms; I hope it is acceptable that I have chosen not to go through that time-consuming and futile exercise on this occasion. My request for the application pack, made in public, on the 14th of October has not at the time of writing resulted in my receiving a copy. I would note that for a voluntary role a deadline of 5pm on a Friday is unhelpful; especially given the likelihood the public sector is not going to do anything with applications received until after the weekend. This is far from an isolated example, the public sector often uses such a deadline, especially in relation to consultations which are often completed by those working on a voluntary basis. I have copied member of the panel Cllr Wilkins on this message so there can be independent confirmation it has been sent. I have never formally been known by any other name. I have used a wide variety of online usernames, most notably my Twitter username RTaylorUK, I do not hold a comprehensive list. At various times people have chosen to call me by nicknames, generally these have been abbreviations of my name. On the 19th of October 2012 I asked Peterborough City Council, who are providing the secretariat for the panel, why this information is being requested. I suspect it may be to carry out vetting of some form and would like to know what is proposed before deciding if to provide the information or not. References: Please give details of two people, not related to you, who have agreed to be contacted by us about your application. It would be helpful if one referee was familiar with your community activities. We intend to take up references for shortlisted candidates prior to interview. If you do not wish us to contact your referees at that stage then please indicate this clearly. Address: [Details from http://julianhuppert.org.uk/contact/ provided]. Tel No: [Details from http://julianhuppert.org.uk/contact/ provided]. Email: [Details from http://julianhuppert.org.uk/contact/ provided]. Position: Cambridge’s, and my, MP. @RTaylorUK happy to support your application as an independent PCP member! Position: Reader of my tweets and website. I declare that the information I have given is true and complete. Signed ….Richard Taylor… Date …25 October 2012.. The information in this section will not form part of the recruitment process and will be separated from your application form upon receipt. The information provided will be used for monitoring purposes and to help us to develop our policies and practice. The information provided will be treated confidentially and be subject to the provisions under current equality and data protection legislation. You do not have to answer these questions. However, by answering the questions you will help us to make sure that our recruitment is fair and accessible to everyone. What is your current employment status and occupation, if any? I am employed as the director of my own company Sci7 Ltd. I work in the biotechnology / pharmaceutical / Information Technology field. Please give details of part-time and full-time employment, voluntary work, career breaks and any other work you do or have done in the local community. If you do not live in Cambridgeshire and/or have not done so during the past 12 months please include the main location of your work if this is different from your employer’s address. Civic activities carried out in public, and recorded via this website and Twitter (RTaylorUK). Regular commentator on local, regional and national policing and crime related matters. I use, and promote, Cambridge’s local democratic police priority setting meetings; and have lobbied to retain them. As an undergraduate student I was an elected representative and member of Imperial College Union council for two years. The ability to think strategically – To have breadth of vision – to rise above detail, and to see problems and issues from a wider, forward-looking perspective – and to make appropriate linkages. In looking at the impacts the transition to Police and Crime Commissioners will have I have commented not only on local, but national strategic matters, including for example suggesting commissioners will need to play a national role scrutinising national bodies, particularly the National Crime Agency and ensuring they are working to support commissioner’s aims and providing the services needed by local police forces. Given the extent of change I think commissioners, police and crime panels, and MPs will have a role in considering how effectively the changes have been and discussing how they might need to be amended. In relation to my lobbying for local, democratic, police priority setting, in addition to defending this way of working locally where I live I have also been considering and investigating and making suggestions on what kind of strategic approach could be taken by a commissioner which would recognise the diverse democratic landscape which varies across the force area. I understand it would not be appropriate to use a position on the panel to pursue my my own views and ideas, but I think having developed my own position is helpful when it comes to assessing others’ proposals and performance in an area and this is an example of an area where that may apply. I have always sought to pitch my activities at the appropriate level. For example I would point to my lobbying related to the way Cambridgeshire Police, in 2008, stated they viewed the PACE codes merely as optional guidance rather than an important part of the law which they must follow. While my interest in this was initiated by a personal local experience I realised strategic issues at a force wide, and national level, were raised and pursued them via the Police Authority and MP, resulting in an important change in the force’s stated position. The ability to make good judgements – To take a balanced, open-minded and objective approach – for example, in evaluating the priorities of the police and crime commissioner, assessing candidates for top level appointments or considering complaints against the police and crime commissioner. I am a genuinely independently minded individual. I have no political party allegiance or religious or ideological beliefs which I consider would counter or distract from taking a balanced, open minded and objective approach to evaluating a police and crime plan’s priorities or commenting on candidates for senior appointments. I am scientifically trained and numerate with experience of carrying out objective commercial technology assessments. While I do not have experience of assessing candidates for senior positions I am aware I do not have that experience, which will hopefully be available to the panel via professional advisors and perhaps other panel members. Though my volunteering with WhatDoTheyKnow.com I am routinely involved in making difficult judgements, along with other volunteers including the organisation’s trustees, about the publication of material we are asked to remove from the site including potentially defamatory material, personal information and materially accidentally released by public bodies. This involves coming to justified, balanced, judgements following consideration of, for example, the public interest, impact on individuals and legal risk. The ability to be open to change – To be able to challenge accepted views constructively without becoming confrontational, and to recognise and respond positively to the need for change. Policing is in a constant state of change; I think often the general public not being aware of changes to policing, such as the introduction of PCSOs and their roles, makes public debate on policing challenging. I’ve always actively sought to discover what the current position is and to ensure I am commenting and responding to that. Good evidence that I challenge constructively is I think the positive and communicative relationship I have with many of the elected representatives who are the subject of my scrutiny, lobbying and commentary. Cambridge’s MP Julian Huppert who I have critically questioned when he was a councillor, during the 2010 general election hustings in Cambridge and while he has been serving as an MP is supportive of this application. For a number of years now I have campaigned against the roll out of TASER to all front line police officers. That remains my view, but in light of the re-organisation of police forces and budget cuts reducing the availability of, and increasing the per-use cost of, armed response units I have modified my views and no-longer say TASER ought be limited only to armed response units; the key thing for me is they are not routinely carried by large numbers of officers and those armed with them are suitably trained and experienced. My views on 20 mph limits and their enforcement have similarly developed over time in light of changing circumstances. I am trained scientist, and have worked as a researcher and in the scientific field. Being appropriately sceptical of accepted views, being prepared to see such views overturned in light of new evidence is key to taking a scientific and analytical view of the world. I seek to take a rational view of the world and hope my education and experience enables me to do that. The ability to scrutinise and challenge – To be able to rigorously scrutinise and challenge constructively, using appropriate data, evidence and resources. Scrutinising and challenging, local elected representatives and bodies such as the police authority is something I have been doing extensively over the last few years. I have always sought to do so while citing the sources of information I am basing my comments on, the articles on my website at rtaylor.co.uk demonstrate that. As a member of the team at WhatDoTheyKnow.com I am an activist seeking to expand the amount of public sector evidence and data available, in an easily and authoritatively citable manner, to those wishing to scrutinise what is being done on their behalf by public bodies. The ability to be analytical – To interpret and question complex written material – including financial and statistical information and other data such as performance measures – and identify the salient points. On many occasions I’ve observed Cambridgeshire Police Authority in committee, and at full authority meetings review police performance reports. I am aware of what has been provided in the past, and how it has been used as the basis for scrutinising the activities of the force. My scientific training; as well as experience commenting on public sector statistics has led to me developing an ability to comment critically on information provided and identify what has been omitted. A key example is my lobbying relating to police phone answering data where I drew attention to how the performance data lacked key information such as by how much targets were being missed when they were not met. I have experience in analysing financial information both relating to private companies I have been involved with and in the public sector since being a member of my student union council at Imperial College through to monitoring and commenting on the my local council’s performance and plans. I have followed, and commented in depth, the two recent significant financial mishaps at Cambridge City Council; in respect of Icelandic investments and significant losses related to Folk Festival ticketing. The ability to communicate effectively – To be able to communicate effectively both verbally and in writing – and to interact positively with other members of the Panel, the police and crime commissioner, and the public. I regularly speak in public at committee meetings, public meetings and on the radio. As someone who is passionate about democracy I have huge respect for democratically elected representatives such as councillors and the commissioner. I routinely communicate everything I do related to public and civic matters via Twitter, in a succinct and timely manner. I publish further information, often both in bullet point, and in-depth form, on my own website. Both Twitter and my website are two way forms of communication via which I regularly enter public debate. I would intend, if appointed to the panel, [to] continue these activities and aim to be as open as possible about my activities in relation to it. Team working – The ability to play an effective role in meetings through listening, persuading and showing respect for the views of others. I was a co-opted member of Cambridgeshire County Council’s Safer and Stronger Communities Overview and Scrutiny Committee in December 2011 and raised a number of issues, including continuing my lobbying for the release of more detailed police phone answering performance. I believe I was invited to participate in the scrutiny committee as a result of effectively using the public speaking slot at public meetings. In relation to volunteering on WhatDoTheyKnow.com; team meetings in relation to the running of that service involve those with different interests perspectives on the service. To provide a useful service to our users, requires open and collaborative discussion among those who would like to, for example take less legal risk, or conversely, publish more potentially problematic material, and reaching a position which while everyone will not agree with, has been collectively determined. Self-confidence – The skill to challenge accepted views constructively without becoming confrontational. As part of my lobbying and campaigning relating to the Police use of TASER in the UK I regularly debate the subject on local and national media. I have been happy to express and defend my views on television and radio in response to challenge from members of the public, lobbyists taking alternative positions and presenters / journalists. These have invariably been civilised discussions, the debate has been conducted in a manner enabling listeners/views to consider the positions put forward, and I am often invited back. I have regularly used the public speaking slot at Cambridge City Council meetings; and have spoken at a number of large public meetings in recent years in Cambridge, including for example those relating to the City Council’s management of trees on my local open spaces of Jesus Green and Midsummer Common. I don’t think that confrontation is something to always shy away from; I think robust debate is a necessary part of the democratic process and for us to decide how we are going to run society. I do not avoid discussing controversial topics, for example racial inequalities in police use of stop and search, even though that is an area, like many others, on which people hold such strong views that some degree of incoming confrontation is almost inevitable when engaging with them. In my view the appropriate response is to seek to remain calm, measured and rational. We cannot have areas which are critical to public policy which are no-go areas for open debate; there is a need in my view to tackle these issues for example through well run and moderated public contribution opportunities both in-person and online for the Police and Crime Panel. Enthusiasm and drive – The ability to be proactive in seeking out learning and developmental opportunities to enhance knowledge and understanding (for example, on financial matters and statutory requirements). I have been following the passage of The Police Reform and Social Responsibility Act 2011 through parliament and am keen to follow and learn about how it is being put into practice. I have sustained enthusiasm for democracy, openness and accountability over more than a decade since (and perhaps a little before) my time at university with involvement in the Students’ Union through to my current interest in democratic accountability and strategy setting in local policing. This training probably alludes to training of panel members. I would be very keen to take any opportunities to extend my knowledge; though I consider there is a need to be sceptical about the quality and intent of those providing training and advice. I note for example a panel member saying they have been advised the panel cannot meet until January 2013; something I have questioned. It is often useful to be taken through something by experts and that can speed up a learning process but there is a need to verify key information from original sources. Respect for others – The capacity to treat all people fairly and with respect, to value diversity and respond sensitively to difference. I think it is important that anyone with a public role makes clear that they want to see everyone treated equally by the state irrespective of factors such as race or age when those factors are irrelevant. People in Cambridgeshire have very diverse religions, cultures, means, and ways of life. I think the key thing in in respect of policing is that everyone must be treated equally under the law. I would say people need to be treated with due respect; I do not for example think that challenging or asking probing questions when appropriate is disrespectful, however others can, and do, disagree. Integrity – The necessity to embrace high standards of conduct and ethics and be committed to upholding human rights and equality of opportunity for all. I agree with the importance of high standards of conduct and ethics and broadly with upholding human rights and equality of opportunity for all. In the latter case I think what’s important is meritocracy. Human rights can be a complex subject. Are my human rights breached by the fact we have a hereditary monarch and I cannot have a say in who ultimately rules the country in which I live? Is it a breach of someone’s human rights to prevent them committing suicide? I would like to see all those holding positions of authority and responsibility subscribing to the “Nolan Principles” on standards in public life; I have promoted this view in relation to the University of Cambridge and a Students’ Union. Decisiveness – The ability to show resilience even in challenging circumstances, remaining calm and confident and able to make difficult decisions. As someone who regularly comments on civic and public matters I often come to a view, make that public, and defend and enter into debate in relation to it. I think this is something which we need as a society to encourage more of, so there is more open debate about the way our public services and society as a whole operates. I’ve never been in a public position where I’ve been required to make difficult decisions in challenging circumstances. I’m happy to discuss my personal background in detail with the interview panel and help them form a view on if they consider if I am a suitable person for the position in relation to this aspect of the requirements. In Autumn 2012 Cambridgeshire County Council’s Cabinet member for Public Health created a “cabinet advisory group” to look at emergency planning / disaster preparedness in the county which he invited me to join. I attended, participated in and have reported on, the meetings of this group which included an emergency exercise. I have attended, and expressed views on local police priority setting meetings across the Cambridgeshire Police Force Area including: Ely, Wisbech, Bassingbourne and Melbourn, North Cambridge, Sawston, Orton Goldhay, Peterborough, East Cambridge, South Cambridge, Histon, Impington, Cottenham, Milton, Chittering, Oakington and Waterbeach, Barton, Bourn, Caldecote, Cambourne, Caxton, Comberton, Coton, Croxton, Eltisley and Granchester and West/Central Cambridge. On a number of occasions I have spent time at Cambridge Magistrate’s court; and have commented and lobbied on the basis of my experiences. I have also served on Crown Court juries in Cambridge. In January 2010 I attended the Royal Courts of Justice to personally witness, report and comment on, the start of the first modern criminal trial in the UK where the defendants have been denied a jury. I have also observed, and used the public speaking slot at, Cambridgeshire PCT board meetings. Why do you want to be a co-opted independent member? My campaigning, activism and volunteering is driven by a desire to live in a meritocratic society with a thriving representative democracy where civil liberties are protected. Significant changes to policing locally and nationally are underway. I’m volunteering to offer to help shape this new environment in a more direct and effective manner than I would expect to be able to from outside the panel. I think my experience of observing local police priority setting around the force area; and of following the activities of the Police Authority over the last few years put me in a good, and I believe unique, position to assist councillors on the panel in their roles. Whoever is the commissioner, they will need all the help they can get to make the most of the substantive new position. I want to see an effective Police and Crime Panel, assisting the commissioner in areas such as monitoring police performance as well as providing constructive criticism and scrutiny during the course of the commissioner’s period in office. I’m putting myself forward to offer to help achieve that. If you are employed, is your employer willing release you to carry out the duties of a co- opted independent member of the Cambridgeshire Police and Crime Panel? I am employed by my own company which I wholly own so this is not particularly relevant. I will make myself available to carry our the duties of the role if appointed. Do you hold, or have recently held, any of the following positions? Is there anything in your private or working life, or in your past, or, to your knowledge, in that of any member of your family or close friends, which, if it became generally known, might bring you or the Cambridgeshire Police and Crime Panel into disrepute, or call into question your integrity, authority or standing as a member of the Panel? If yes, please give details. Not in my view, no. There is nothing in my view, of relevance to a public position such as this, which is not already openly published on my website. This is an impossible question to answer as I cannot know how others will interpret things. Offering to volunteer for the Police and Crime Panel for example has perhaps damaged my reputation among some people who see it as “going native” and losing my independent position from which to lobby and comment. I viewed making this application as potentially a significant threat to my integrity, particularly given how poorly the positions have been advertised, the presence of an advert for two weeks or so on the front page of a number of local council websites has just about pushed it over the threshold of being defensible as an “openly advertised position”. I have commented publicly on a number of commissioner candidates and members of the shadow panel and have made my own views public on what I think Cambridgeshire’s Police and Crime Commissioner should do, something which prompted a number of people to offer to nominate me to stand, many offering to help with a deposit too. This entry was posted on October 26, 2012 by Richard Taylor. Please note I’m out of the office until Monday 29 October 2012 and will deal with e-mails on my return. Please contact Mandy Long regarding Neighbourhoods issues and Sara Moore regarding Business Support issues in my absence. This shows I was right to question the deadline of 17.00 on Friday 26 October; nothing is to be done with the applications until Monday morning. The deadline could have been extended over the weekend with no impact on the handling of the applications by the panel’s secretariat. I note the above auto-response is on the email address given for further information about the posts on the adverts; if there has been an auto-response there for some time people seeking details prior to putting in an application may not have been able to get a timely response. Good luck! I would have nominated you for last week, and contributed to the deposit, but I was away, pity you didn’t think of standing earlier, I’m sure there would be plenty of support. I am in two minds as to whether you will serve the public better viewing the activities of this body from the outside, or being part of the gang. On balance I think your critical role outside the tent would be sorely missed. However, if you do get selected I hope your voice will not be lost. Incidentally if you are selected perhaps you could ask Councillor MacGuire about the appointment of his wife to the Police Authority in November 11th. I cannot find any reference to this in the Apointments Committee minutes. The membership of the 3 man Appointments Committee included Councillor MacGuire and presumably his membership at the time of his wifes appointment was coincidental. I don’t the panel should be looking back at past appointments to the Police Authority. Personally I wouldn’t focus on the appointments committee; the full County Council voted on making their recommendations to that body and Cllr Viv McGuire was recommended by them. My view is that many appointments to the Police Authority were used to reward councillors; they were somewhere group leaders could use their patronage and give people roles which came with hefty allowances and expenses on top of those which come from being a councillor. This is something I raised during the February 2012 consultations on councillor allowances, I think the independent panel were misled by the council when they were told the total allowances etc. received by councillors is public – it is not easy to find and well publicised information, and certainly no one adds it all up. It has been a full working week since I submitted the application and I have had no human acknowledgement, or any other contact relating to the application. Two working weeks on, and still no response of any sort beyond the automated out of office message quoted above. With the next meeting of the panel in a few days have you received any response to your application to volunteer for the panel? I still have not heard anything. The meeting of the Cambridgeshire Police and Crime Panel on 21 November has been given a “title/purpose” of “meet the commissioner” but it is still marked “private meeting”. Cambridgeshire Police & Crime Panel. regret to inform that you were unsuccessful. further feedback regarding your application, please do not hesitate to contact me. No further information is available to identify these people. Christine Graham who I noted was present at a police priority setting meeting in Peterborough is the Christine Graham appointed to the panel, she has listed the appointment on her website. She tweets as CGConsultancy “consultancy, training and briefings” on community safety and anti-social behaviour. She is offering a half day course on Partnership Problem Solving in December 2012 for £120. Googling Raja Ali leads me to the East of England Islamic Teaching Intensive 2011 where a Raja Ali had a role in taking bookings and a Raja Ali an observer on the “Peterborough Local Strategic Partnership” (whatever that is or was) in 2009 as well as positions with the Greater Peterborough Partnership and Peterborough Muslim Community Network. Same old faces………………….same old pig trough…………………………..same old cover ups……………………nobody ever does anything about it…………………………see ‘waste of resources on the County Council facebook site. Raja Ali was absent from the Police and Crime Panel meeting on the 12th of June 2013. Christine Graham made no contribution during the substantive agenda item scrutinising the commissioner’s decisions. The point has already been made, rather than waiting until today, to say we want to scrutinise that, if we could have said it in advance we could have been discussing it now I think that’s the point that Ben’s making rather than waiting until July. While the minutes for November 2013 and February 2014 have not been published in approved form my Video from the February 2014 meeting confirms the November 2013 minutes were approved without amendment and shows 17 people around the table they are: The Police and Crime Commissioner and his deputy, Chief Executive and Acting Chief Finance Officer. Two committee officers, Independent member Christine Graham, an officer from a council, and Cllrs Ablewhite, Kahn, Shellens, Bick, Hunt, Curtis, Over, Shelton and Todd. Councillors not attending any meetings for six months (without a leave of absence approved by the council) would be cease to be a member of the council under Section 85 of the Local Government Act 1972 “Vacation of office by failure to attend meetings”. Paragraph 3.25 of Cambridgeshire Police and Crime Panel’s rules of procedure gives the panel the power to terminate the appointment of an independent member: “if the co-opted Member has been absent from the Panel for more than three months without the consent of the Panel”, but there is no requirement for the remaining panel members to terminate the appointment of an independent member who isn’t turning up. The Police and Crime Panel don’t publish contact details for all members, and Mr Ali is one of those who hasn’t made any contact information public. I’ve noticed that, according to published information, you’ve not attended a meeting of Cambridgeshire’s Police and Crime Panel since March 2013. Could you let me know why you have been absent? Do you intend to attend and participate in future meetings of the panel?